However, without curriculum actually designed for NGSS, this kind of learning cannot happen. What are the differences between “aligned” vs. designed NGSS curriculum? 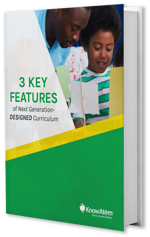 What are 3 features shared by all next generation-designed curriculum? What does actual NGSS-designed curriculum look like in the classroom? Fill out the form on the right to get your free eBook now.